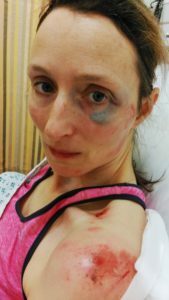 So, all you trail runners out there – I’ve often heard that you’re not considered a ‘proper’ trail runner until you have had some gnarly falls with gruesome injuries to show for it!! Falling hurts! It really does!! 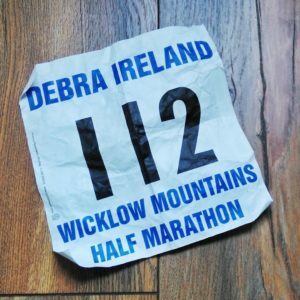 When I received my Wicklow Mountains Half Marathon race number in the post from Debra Ireland, I thought it was funny that my number was 112. The same as that for emergency services Europe wide. I’m not so sure ‘funny’ was the correct word, I’m thinking more along the lines of irony now. I giggled about the number with some friends prior to the race, went to the loo about 500 times, paced the Brockagh Centre and car park with the usual pre-race nervous excitement that is so familiar to anyone who has ever participated in such an event. After a final check of my gear, I hopped on the bus to bring us to the start line. This is the seventh year of this race and considering it is always held in early March, the weather for each of those races has been remarkable. Today was possibly the worst of it, but it was still only a light drizzle and the wind was forecast to be light and at our backs. Ideal. I much prefer to be slightly too cold when running, it makes the going so much easier. Starting slowly as planned, I took breaks at the usual bottle-necks. Besides being a firm believer in the principles of ‘Leave no Trace’, I don’t take myself seriously enough to trample down farmers’ fences. I am only competing with myself after all. The winners of the race are long gone. It was less than a week ago that I was hauling sleds in the Arctic, but despite some residual fatigue, I felt strong and was running well. Making steady progress on the ascents. Better than last time I noted mentally. Although the legs were tired, my heart rate was fine so I simply kept lifting them and moving forward at what I felt was a respectable, sustainable pace for me. I was looking forward to the long descent in Glendalough, I was smiling and feeling strong and capable. Descents are my forte, I’ve always been fast and sure footed – possibly from years of hiking on open mountainside. Perhaps because of that I lost concentration, but whatever the reason, shortly after the water station, 8.5 miles into the race, less than 5 to go, I fell. Hard. I’m going to land face first and possibly damage my spine too. The runners in front of me and behind me are a long way off. I reacted in that instant by twisting my body to the left as much as I could and inhaling sharply. When the impact came, I was ready to use that air to holler. I felt the full force of impact on my left cheek, a rush of heat travelled through my head. I imagined the collapse and crush of my bones. My upper body had managed to twist leftwards more than the lower body perhaps, or maybe there was just a higher rock on that side. I got my hands up to hold my sore face and keep my spine in alignment and roared. I mean really roared. Feeling grateful that I could roar, I drew my right knee into my body, it was pulsing with pain, and roared again. Somewhere in my brain, it registered that I was able to move my extremities and able to think clearly. Relief mixed with pain and anxiety flooded my system. I needed to get out of there. Quickly. Cindy has her own blog www.GoWild.ie where she shares tips on trying to juggle parenthood and the outdoors. You can read about her subsequent rescue there and follow her recovery and return to the mountains.